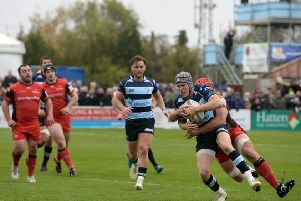 Lindsay arrived at Goldington Road during the summer of 2017 and has been in splendid form throughout the campaign. Blues director of rugby Mike Rayer said: “Tom has been brilliant for us this season and now gets his reward by with an opportunity to join Bristol next season, which will no doubt be in the Premiership. Speaking about his departure, Lindsay added: “First and foremost I want to thank the players, coaches, staff and all of the wonderful fans for making me feel right at home as soon as I arrived at Goldington Road last summer. “Bedford Blues is a very unique club that plays a wonderful brand of rugby and it really helped me to rediscover my passion and fall back in love with the sport.